When you visit a place and love it so much that you promise yourself you’ll be back, how often do you actually go back? For me, it’s not nearly as often as I’d like. But Robin Hood and I made ourselves that promise after we visited Red River, New Mexico back in November…and last weekend, we actually kept the promise! Our visit fell during the town’s off-season, but not quite as “off” as our November visit. Meaning: the number of other people out and about wasn’t exactly ghost-town level, but it was still low. We nearly had the place to ourselves. It was heavenly. We stayed at the same place we did in the fall, and if you ever visit Red River, I really can’t recommend Rio Colorado Cabins highly enough. They have different cabin sizes to choose from, the cabins are clean and cozy, and the prices (especially off-season) are reasonable. We again chose a cabin on the pond, and although there weren’t as many ducks there as in the fall, there were a couple that splashed, quacked, and executed fantastic water landings during our stay. Ann, our coonhound, was curious about them, but luckily there were ample other distractions for her, so the ducks stayed safe. Enjoy the gorgeous springtime scenery. Eat delicious food / drink tasty local coffee / peruse souvenirs with no wait whatsoever. Continually get startled by deer moseying casually about. The answer is simple. Go fishing. 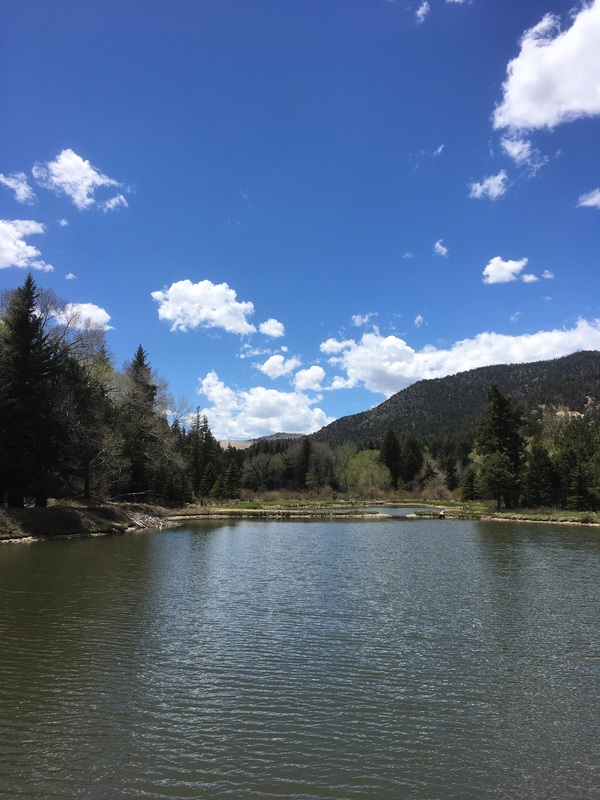 On both Saturday and Sunday, we fished at the ridiculously scenic Fawn Lakes (there’s also a campground there; maybe some day we’ll give that a whirl), just outside of town. 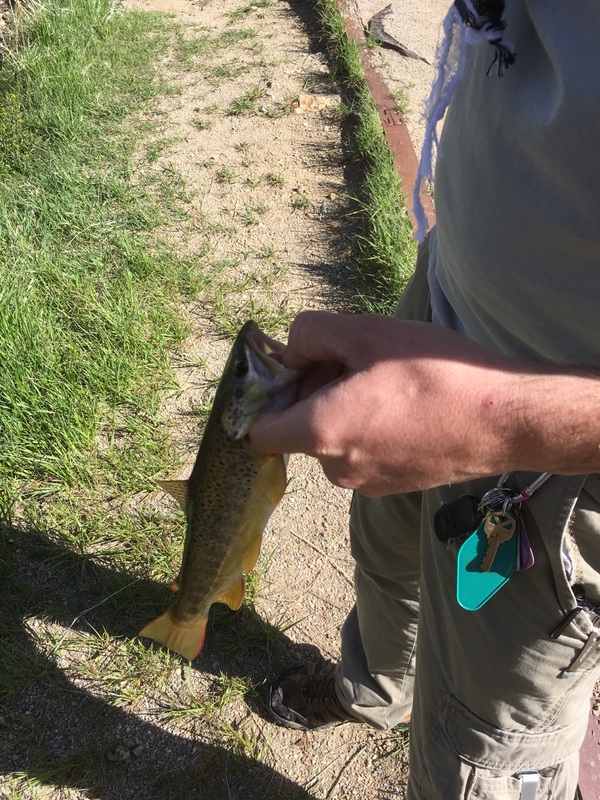 The first day, Robin Hood opted for fly fishing, while I stuck with the relatively straight-forward spinnerbait. Our only other plan for the day was going to dinner at some point. I want more days with that kind of schedule. We fished till we were tired and hungry. Ahem. Okay, till I was tired and hungry; my fisherman could probably have stayed on the water for hours longer. But in that time, I’m proud to say, I caught a trout! All by myself! There are few things in life like the feel of that tug on your line. And when the fish is securely on the stringer? It’s beautiful. The next morning, we returned to the lakes bright and early, which paid off when Robin Hood caught a trout soon thereafter. That day, I started out with a spinnerbait, but then switched to a bobber-and-worm set-up. I didn’t catch any fish that day, but I began to understand what all the fuss is about. On the shore of a tucked-away lake, surrounded by trees and mountains, with cool air on your skin, sunlight on the water, and peace in your heart, is one fine way to spend a Sunday morning. When we returned to Albuquerque that evening, we had trout for dinner. And yes, we will be going back to Red River. we will be there this time next week! But we’re going to be camping! I miss my home state! FYI: suggestions for what to do when we get there? 🙂 Places to eat, or hang out places we must see?